We're specialists. We don't do anything but CNC Swiss turning and CNC Swiss Micro/Miniature Machining. And because all of the parts manufactured are no larger than 1-1/4 inch diameter, Pacific Swiss is able to draw from a previous part's machining experience and apply it to another part if the materials are relatively the same. Half of what the company produces goes to the medical industry, specifically medical equipment OEMs and surgical appliance. These features allow complete machining in a single operation. Although conventional CNC lathes can perform C axis live tool work, the unique design of Multi Axis CNC Swiss-type machines gives the user more capabilities with greater accuracy. Philips Medical is one of our largest customers, and parts produced include minimally-invasive surgical tools and surgical appliances, such as spinal implants, dental implants, laser and ultrasound parts, and critical contacts for Automated External Defibrillators (AEDs). Pacific Swiss also produces parts for the sports and recreation, motion control, and fiber optic, nuclear testing industries, among others. The benefit of an 8-axis machine is that it primarily allows us the ability to produce simple to extremely complex parts in one machining operation, in which the part comes out of the machine virtually burr-free. 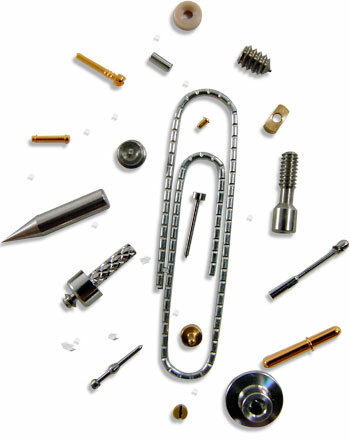 As is typical with medical parts, they require extremely tight tolerances and high surface finish callouts. Every day, we make parts with tolerances of plus or minus .0005 inch and surface finishes of 16. We offer dock-to-stock quality and managed inventory systems for our customers. Customers can order large quantities and have deliveries set forth by scheduled P/O dates or by on-demand "pull-in". We are able to achieve short lead times by "running lean". This entails running "lights-out" and consolidating like-sized CNC Swiss Micro/Miniature Machined parts.